The Holocaust Remembrance day falls on May 2 this year and in the few following posts I will publish several documents concerning the treatment of the Jewish population in my hometown of Odessa, Ukraine issued by the Romanian Authority which occupied Odessa from 1941-1944. At the beginning of the occupation there were 80,000-90,000 Jews who did not evacuate from Odessa. When the city was liberated on April 10, 1944 there were reportedly only 600 left. Somewhere in the Odessa Region my 6-year old Father survived in the ghetto with help from kind people and lots of luck. The area where he lived with my Grandmother was occupied by the Italians who were not very enthusiastic about being in the war and their relative reluctance to torture and execute the Jews might have resulted in more survivors than in the areas controlled by Romanians who proved themselves to be ruthless murderers. Many places in Odessa and the Region have memorial markers where the executions were conducted, such as a place where over 25,000 Jews were burned alive shortly after the occupation started. Unfortunately, I never stopped or paid attention to them, probably like most people. I saw more memorial markers today, while researching this post, than I remember seeing when I still lived in Odessa. The Russian text is found in the National Archives of the Odessa Region, translation mine. If I have time and patience I will also try to translate a personal memoir written by a survivor; translation is a long and tedious process, and even though I start with a machine translation, it still doesn’t always come out right. Feel free to let me know if I can correct some grammar or spelling errors. 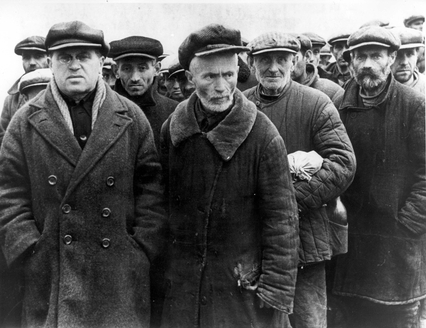 Order of November 7, 1941 by the commander of the city of Odessa praetor Colonel Niculescu that all the men of Jewish descent between the ages of 18 and 50 shall, within 48 hours report to the city jail, and their families – deliver the food to the imprisoned Jews. “Odessa newspaper”. – November 7, 1941 – № 25. – P. 4. Art. 1. All the men of Jewish descent, aged 18 to 58 years are required to appear at the city jail (Greater Fountain Rd.) within 48 hours from the time of publication of this order with only the essential items. Their families are required to bring them food to jail. Those who disobey this order if found after the expiration of the 48-hour period, will be shot on site. Art. 2. All the inhabitants of the city of Odessa and its suburbs are required to report to the appropriate police units every Jew fitting in the above category who failed to comply with this order. Those who harbor, as well as those who know and fail to report the Jews will be punished by death. Art. 3. Officers of military and civilian police are charged with determining what constitutes the violation of this order. Art. 4. This order is published throughout the city and suburbs, streets, public buildings, railway stations and port and is in force upon its publication. Order № 23 dated November 11, 1941 Romania by Chief Marshal of military forces Ion Antonescu and the Civil Governor of Transnistria G. Aleksyanu about a special registration for the Jews, preparation of special lists, resettlement of Jews in the colonies and the organization of their work duty. “Odessa newspaper”. – November 20, 1941 – № 9. – S. 2. Art. 1. All the Jews who arrived in Transnistria from areas of hostilities or who lived previously in Transnistria and resettled in other areas in connection with military operations, as well as those Jews who will later be relocated – have a responsibility to obey the rules set forth in this order. Art. 2. Inspectorate of the Gendarmerie of Transnistria establishes areas where Jews can settle; resettlement is made in accordance with the number of family members in homes remaining from the Russians and Jews who have fled. Every Jewish family receiving the housing, should bring it into a proper condition and keep it clean. If the number of dwellings should prove insufficient, the Jews could be settled in private homes specifically assigned to them, with the establishment of predetermined rent. Art. 3. All Jews who are a part of any such settlement or community, must be entered in a special list which states: name, nationality, religion, age, occupation, location of origin. Every Jew will be issued a document listing all of the above data. Art. 4. No Jew can leave the assigned settlement without a special permission issued by the district or county Prefect (police chief). Art. 5. All Jews who are a part of a settlement form a colony, which is managed by the head of the colony, appointed by the praetor from the population of the settlers. Assistants to the Chief of the colony are the team leaders: Chief of the colony appoints a leader for each group (20 people) who is responsible for the presence of all its members, cares about their well-being and reports each violation committed by any member of the group. Chief of the colony and team leaders are responsible personally for the presence of Jews in the colony and the execution of the orders of the Administration and the Gendarmerie. all others (those of unskilled labor) will be at the disposal of city or rural authorities and will be used in various tasks for the needs of the colony, town or village, or other works for public purposes. In particular, they will be used for field work, to work on improvement of roads and bridges, on harvesting of timber and wood, stone and other materials. Food ration cards will be issued for the day worked, equal to 2 marks per day for the skilled laborers and tradespeople and 1 mark for the unskilled laborers. Gendarmerie authorities are obliged to constantly check and monitor the status of Jewish settlements, bringing to the attention of higher authorities all the detected violations. Art. 7. The Jews from one colony will be allowed to work in another colony only with the permission of the district or county prefect. The movement of specialists from one district or county to another will only be allowed with the permission of the Director of the Division of Labor with the Civilian Government. Art. 8. Every Jew found outside the colony without proper authorization will be treated as a spy and immediately punished by military laws in time of war. Art. 9. Jewish professionals may be used with the permission of the Governor for the restoration of the industry destroyed by war, rebuilding of businesses, or on any other work deemed necessary. Art. 10. District and county prefect and the Gendarmerie inspectors are charged with the responsibility of bringing this order into execution. Signed in our office November 11, 1941. *Transnistria Governorate (Romanian: Guvernământul Transnistriei) was a Romanian administered territory, conquered by the Axis Powers from the USSR during Operation Barbarossa, and occupied from 19 August 1941 to 29 January 1944.